So much commentary about fighting climate change is focussed on how hard it will be and how much it will cost and come with dire warnings about how we are still likely to miss our emissions reduction targets. So, we’ve decided to get out and about around the country to let people know how nuclear energy, and particularly small modular reactors, can play a really important role in reducing emissions with minimal disruption to the environment – and at lower cost if we go about it in the right way! The first of these talks was held in April 2019 in Clonmel and was attended by around 35 local people with an interest in improving air quality while preserving the scenic beauty of their local area. It was followed by a really good and lively discussion in which any lingering questions were teased out. Most people left with a clearer idea of how Ireland can reduce emissions in an affordable manner by combining nuclear energy with our existing pylons and overhead cable network, avoiding the need for extra infrastructure where it is least acceptable. This message was particularly appealing to those who oppose running pylons through areas of outstanding natural beauty, as well as those concerned about wind turbines, solar farms and battery banks being placed in inappropriate locations. And almost everybody was surprised to find that all these benefits could be supplied much more effectively by using nuclear energy and at substantially lower cost than by following our current national emissions reduction plan. Please contact us by email (info@bene.ie) if you would like us to present a talk in your area. Here’s a letter we had published in this morning’s Irish Times. It’s attracted some feedback already – but more feedback is always welcome! Sir, – The expensive folly of Ireland’s energy policy in response to climate change is clearly outlined by a number of recent articles in this newspaper. 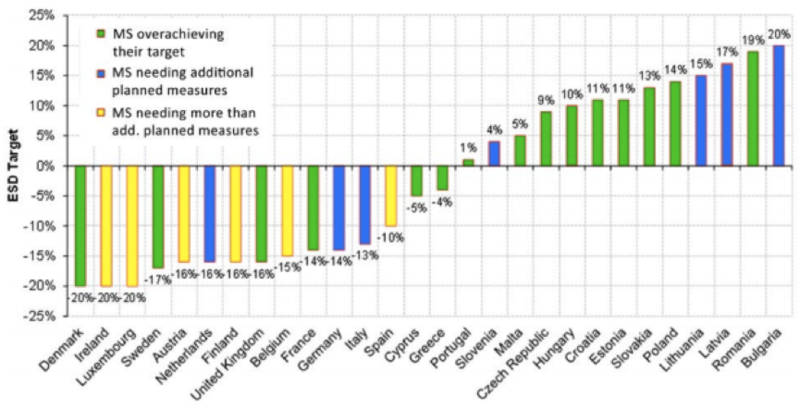 That Ireland’s performance on climate action in response to global warming has been ranked as the worst in the EU (News, December 10th) is unsurprising. What is less well-known is that we are on track to meet our world-leading 40 per cent target of electricity from renewables, mainly wind energy, and intend to spend another €800 million on new wind turbines alone in the next 12 months (News, December 10th), thereby increasing the value of Ireland’s wind turbine fleet to a staggering €4.5 billion. The apparent paradox of leading in use of wind turbines while trailing in reducing emissions is deepened when one considers the claim of Dr John Doherty (Letters, December 6th) that “wind farms may eventually emit more carbon than an equivalent coal-fired power station”. The resolution of the paradox is quite simple, in that emissions reduction to the extent required cannot possibly be achieved by wind energy, even when supplemented by solar and hydro-energy. This physical reality is now abundantly clear to all objective observers and those whose view is unobstructed by ideology or commerce. Those seeking an evidence-based solution to the problem of sourcing clean and affordable energy need look no further than our European neighbours for inspiration, where it is found that the cleanest, cheapest electricity is supplied by nations that have copious amounts of hydro power (Norway) or nuclear power (France) or both (Sweden). To help reduce emissions effectively, we must overcome the EU-imposed fixation with the expensive sideshow that is renewable energy and focus instead on the true objective of genuine low-emissions energy. As our hydro-energy resource is already almost fully exploited, we must review our national predisposition to consider nuclear as being too large, expensive and unsafe. This view is quite at odds with the reality of modern nuclear that safely reduces emissions and costs while avoiding the need to erect wind turbines where valid objections exist. We could also remove the statutory ban on nuclear fission, kick-starting such a review and indicating our serious intent to tackle climate change effectively. Ireland has had no shortage of recent initiatives aimed at delivering a sustainable, reliable and affordable energy system. These include the Energy Green Paper, Energy White Paper, National Mitigation Plan, National Renewable Energy Action Plan, Climate Action Act and National Dialogue on Climate Action – among others. The stated main goals of these initiatives is to reduce emissions of greenhouse gases while increasing our use of renewable energy. Behind the fanfare were some who appeared to believe – without much evidence -that they would actually reduce our emissions. Many more of us – nerds, if you like, who conducted or read the studies – knew that the plans sounded great to those that get up early and trust our leaders to do the right thing, but had no real prospect of reducing our emissions sufficiently. And so it came to pass. Although we are using more renewables, emissions of greenhouse gases continue to rise in Ireland. 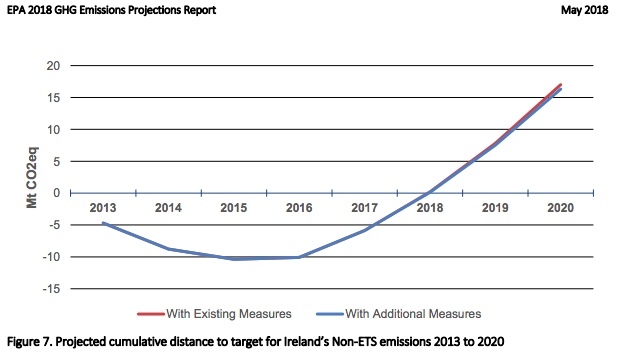 The EPA confirms that we are moving further away from our target trajectory with every passing year, while the Climate Change Advisory Council says that “Ireland is completely off course in terms of achieving its 2020 and 2030 emissions reduction targets“. When taken beside the fact that energy prices here continue to be amongst the highest in the EU, our Climate Action problem is nowhere near solved. The latest initiative is for a Dáil Committee to take up the recommendations of the Citizens’ Assembly who considered ‘How the State can make Ireland a Leader in Tackling Climate Change‘. This process is similar to that which resulted in the recent Referendum on the 8th Amendment to the Constitution, a process that was seen by many as being a political success. Given that the 2 topics are so fundamentally different – tackling Climate Change requires implementing practical solutions while the 8th Amendment raised social, political and religious questions – it is not at all clear that the new Dáil Committee will have more success than we had with the previous initiatives. The committee will begin by looking at the final report of the Citizens’ Assembly. Sensibly, it will also check whether anything is missing from the report before looking at it in detail. The Citizens’ Assembly report is an excellent summary of all the activities up to and including the two weekends of deliberation into the matter. It appears to contain all the relevant submissions from the public, experts and various interested parties and the background information, processes, presentations and final recommendations; and has been rightly praised for the level of professionalism that went into its production. And yet it is missing something. Something important. Something that is perhaps camouflaged by all the data but is fundamental to judging the ultimate effectiveness of the Assembly’s efforts, which is the most important thing of all. That is; will it work? Will the recommendations, if implemented, make Ireland a leader in tackling Climate Change? Or will they simply lead to a repeat of the often-expensive failures of the previous initiatives? In fairness to the Citizens’ Assembly, it was not part of their remit to assess whether the recommendations will achieve the aim of leadership in tackling Climate Change. But who, then, will analyse the recommendations for effectiveness? The Dáil Committee? That remains to be seen. Taking effective Climate Action will require complex societal changes as well as new technology. But at least we know what it is we are trying to achieve, as we can figure out the probable maximum emissions the atmosphere can handle so that average global temperatures do not exceed 2 degrees, the limit agreed under the Paris climate commitments. 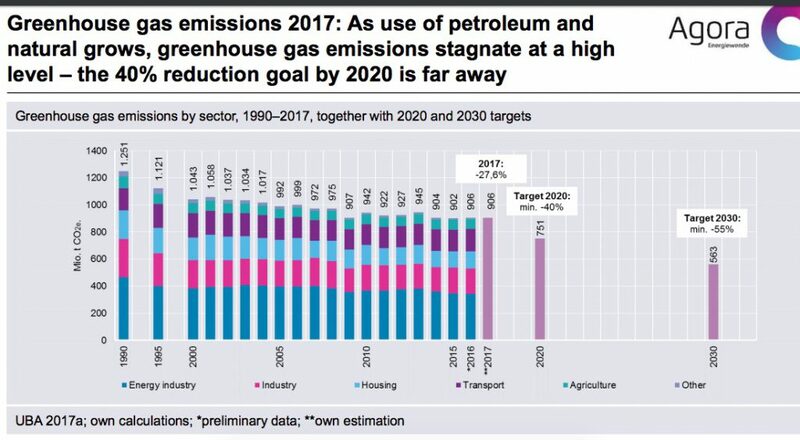 Ireland’s share of these emissions is estimated to be less than 760 MT CO2 – this is our entire carbon budget from 2015 to beyond 2070. Our annual emissions in 2016 were 62 MT CO2, which was a 2% increase over 2015. Simple mathematics shows that our entire carbon budget will be spent by 2030 at that rate, after which we will need to capture and store all our emissions in order to keep to the budget. Carbon Storage technology in still in its infancy and its final effectiveness and cost remains to be seen. But we know that it will almost certainly be required in Ireland within 15 years. Was Carbon Storage discussed by the Citizens’ Assembly? No, not a mention! Will it be discussed by the Dáil Committee? Time will tell. Our previous energy initiatives focussed on replacing fossil fuels with renewables – including wind, solar, wave, tidal, hydro and geothermal. Although we have spent well over 4,000 million euros to date on wind turbines alone, and intend to ramp up this spending, our emissions are increasing instead of decreasing. How can Ireland lead in tackling climate change unless we introduce significant new policy? 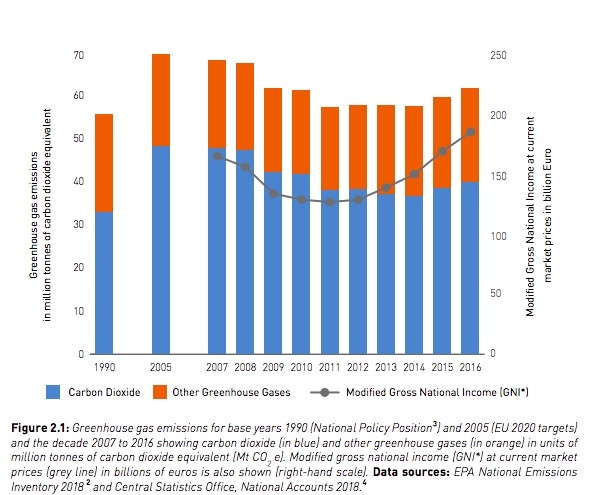 Pretty much the same thing is happening in Germany, where they have spent an estimated 125 billion euros on renewables from 2000 to 2015 – yet their emissions have stagnated (see below). They, also, are expected to miss their emissions targets from the energy sector. That’s not to say that the problem cannot be solved. Fortunately, there are examples of countries who have managed to quickly decarbonise their power systems at reasonable cost and with minimal disruption, and these show us how it can be done. France, for example, replaced almost all their fossil fuels with nuclear energy in the decade following the 1973 oil crisis and now have the cleanest and cheapest electricity in Western Europe. Nuclear technology has evolved since then and there are now reactors that are small enough for Ireland, are cheaper than any other reliable low-emissions electricity, can use existing nuclear waste as their fuel while the resulting waste decays much, much faster than the original waste, are physically incapable of melting down and can be built in 3 to 4 years. These plants can produce safe, clean, reliable and affordable energy to help us meet our climate change targets. The proven climate change solution that is nuclear energy was not part of the discussions at the Citizens’ Assembly. Whether this was due to a shortage of time or short-sightedness on their part we will probably never know. And Nuclear energy will, most likely, also not be part of the Dáil Committee’s deliberations. Thus, it is quite clear that the mistakes of the past initiatives are about to be repeated to further great fanfare and at great expense. While our leaders express the need for ‘transformative societal change’ in order to lead in tackling climate change, the fact of the matter is that we will probably fail to even meet our targets, never mind lead in tackling climate change, if we are not even prepared to have an open discussion of whether Nuclear energy and Carbon Capture will be needed to assist us in our efforts. 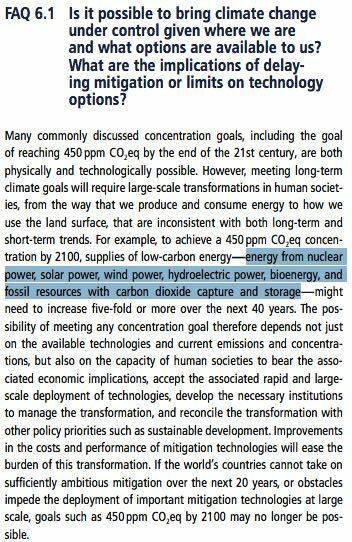 It is worth noting the extract below, where the IPCC says we will probably need both Nuclear and Carbon Capture (CCS) as well as Renewables. If we consciously decide against Nuclear and / or CCS, then we need to be clear about which practical alternatives are to be pursued instead. The time for hand-waving and lofty ideology is long gone. What is needed now is a plan that can be shown to finally tackle climate change – possibly even lead in it – by being effective at reducing emissions in an affordable manner. What could be a more potent sign of our intent to get serious about climate change than to examine our national phobia about nuclear energy, the proven most effective means of decarbonising energy? Calls for a rational discussion of nuclear energy have come in the past decade from 2 Ministers for Energy, ESB, IBEC, ICTU, Forfás and others including Engineers Ireland. Such calls may be resisted by the fossil fuel and renewable industries to delay their inevitable loss of profits when nuclear energy arrives here. But they will be supported by anyone who puts genuine climate action ahead of ideology and who is interested in ensuring a reliable supply of clean, safe and affordable energy with minimum disruption to our natural environment and its relatively unspoilt landscapes. The question is: does the Dáil Committee have the courage to broach the topic and the strength to see it through to a practicable conclusion. Or will it continue along the well-trodden, popular but ill-conceived path to failure? 90 years ago, shortly after Ireland achieved independence, our political leaders had the vision to agree the Shannon Scheme which began the process of, quite literally, bringing Ireland from the darkness into the light. Our need now, while different, is perhaps even greater as we try to maintain a global atmosphere compatible with sustaining human life as we know it. We will soon see whether the politicians of present-day Ireland have the vision to enable Ireland to play its part in tackling climate change – and, yes, perhaps even leading in that role. Mike Shellenberger of Environmental Progress is organising a public event to draw attention to the need for nuclear power to save the climate — and to what he calls “Germany’s unethical effort to kill Europe’s most important source of clean energy”. Along with Amardeo Sarma, a leader of the pro-science movement in Germany, he is hosting a strategy meeting for pro-nuclear activists in Amsterdam, September 1 to 2. Please let me know by email or via the comment box below if you would be interested in attending this event, so we can coordinate an Irish response. Full details of the event are in the Twitter thread he posted today which is reproduced below. 1. Calling all pro-nuclear Europeans! As Germany expands its war on nuclear power to all of Europe, Environmental Progress (EP) is stepping up our efforts to save it. 3. During that time, we have learned what works — and what doesn’t — to save nuclear plants. EP is taking that same winning recipe to Europe. Toward that end, we are inviting our European allies to help us organize a “day of action” in defense of nuclear power this fall. 4. We are looking for people willing to roll up their sleeves and help organize a public event that draws attention to the need for nuclear power to save the climate — and to Germany’s unethical effort to kill Europe’s most important source of clean energy. 5. Germany’s @amardeo Sarma, a leader of the pro-science movement in Germany, and I are co-hosting a strategy meeting for pro-nuclear activists in Amsterdam, September 1 to 2. We have scheduled the meeting so that volunteers from across Europe can attend. 6. Are you interested in participating? If so please email EP’s Paris Wines briefly stating how you heard about the meeting, who you are, and why you want to attend. 7. And, either way, I hope you will consider making a contribution to saving European nuclear plants. We need to raise $50,000 to make things happen on the ground. I promise we will make that little bit of money go a very long way. The first nuclear power station to be built in Britain in many years is now under construction at Hinkley Point in Somerset, about 250 km from the Irish coast. It has proceeded slowly but surely through the many licensing, regulatory and planning processes involved. It has also successfully overcome a number of legal and other challenges at courts in Britain and the EU. But now, Britain has asked Ireland for comments (before 17 April 2018) on the environmental impacts on Ireland of the project, and our Department of Housing is coordinating the Irish response. Britain’s request has come about on foot of representations by some, but not all, of Britain’s EU neighbours, including considerable work by An Taisce and Friends of the Irish Environment. Irish NGOs have welcomed this consultation that indicates that projects that could have an environmental impact, no matter how unlikely, on neighbouring countries will consult with those nations as part of their Environmental Impact Assessment. Their comments about Nuclear energy in general, and Hinkley Point C in particular, are exclusively negative, however, and show no understanding or acceptance of the benefits that Nuclear energy can bring. This shortsightedness is not helpful in helping us arrive at the optimum environmental decision. Comments made by An Taisce, for example, appear to lack balance as they refer to some findings in official Irish studies concerning Nuclear Power impacts on Ireland but fail to put these in the contexts in which the findings were made. For example, An Taisce doesn’t clarify that ESRI’s cost estimate refers only to the most unlikely of nuclear accidents occurring during an unlikely weather pattern, and at a time that would cause the greatest economic impact. They also fail to mention that the majority of the cost could be incurred in trying to counter the unnecessary fear that surrounds nuclear power and not in countering the actual radiological impacts. There is much irony in the fact that the cost of tending to the unnecessary fear fuelled by negative commentary from self-styled environmental groups would be much better spent in tackling the environmental crisis that looms large over us. There also appears to be no effort made by any Irish agency to assess the environmental impact of NOT proceeding with Hinkley Point, and the British new nuclear build programme. If Hinkley Point is not built, how would the 7% of Britain’s electricity be supplied and at what environmental cost? The most likely replacement fuel, Gas, could result in 700 million tons of additional emissions of carbon dioxide over the lifetime of the project. Gas is also subject to interruption for geopolitical reasons, with an associated environmental impact. 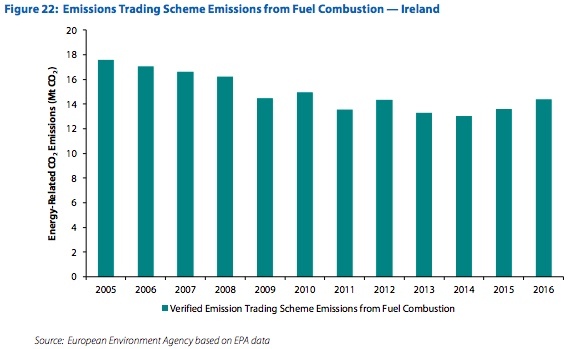 As this is an important topic for Ireland, Britain and global emissions, it is important that decisions are made based on the facts behind the rhetoric. We outline some of these facts and background information here. As it is a complex and – at times – bewildering topic, we expect to update the document as we receive feedback and queries on the points raised. 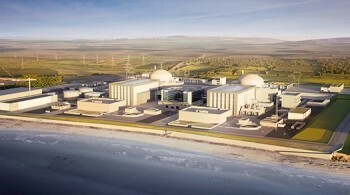 The British Government is inviting comments on the environmental information on the Hinkley Point C Nuclear Power Plant (HPC) being built in Somerset, England. The comments sought are in relation to potential transboundary impacts of the development, although these were subject to environmental impact assessment prior to the plant receiving planning consent in March 2013. Comments must be received by close of business on Tuesday 17 April 2018. Why has Britain offered a consultation? Following assessment by the relevant bodies, as required by British planning laws, Britain formed the firm view that HPC would have no significant environmental impact on Britain or any other country (‘transboundary impacts’), a view which is shared to a large extent by Spain, France, Belgium and Germany. However, Netherlands and Norway said they could not rule out impacts on their environment if there were unintended releases from Hinkley Point, and made their case under the 1991 United Nations Convention on environmental impact in a transboundary context (the Espoo Convention). The Espoo committee handling the case agreed and noted that, while the chance of a major accident occurring is very low, the likelihood of a significant adverse transboundary impact of such accident can be very high. The Committee believed that Britain should be exceptionally prospective and inclusive to ensure that all Parties potentially affected by an accident are notified. While Britain still maintains it has not breached its international commitments on the environmental information in relation to potential transboundary impacts of HPC, they have undertaken to consider relevant comments coming from affected countries and to respond where significant impacts are identified. In addition, Britain has also volunteered to undertake similar consultations as part of the licensing process for future nuclear power plant projects. What does the British study say? British assessments conclude that it is very unlikely that significant international environmental impacts would arise from routine works during construction, operation, maintenance or decommissioning/site remediation. The transboundary impact of unplanned emissions, as assessed by the developer (EDF), is set out in Appendix 7E of the Environmental Statement. Their Environmental Impact Assessment determined that the Radiological impacts on human and non-human species “do not extend beyond the County of Somerset and the Severn Estuary” and says the nearest Irish territorial waters are “well beyond the area in which impacts are likely” as they are approximately 230 km from Hinkley Point. What do the Irish studies say? There are two significant Irish studies into the matter – a technical study by the RPII to identify what the radiological impacts of a serious nuclear accident in Britain would be, followed up by an economic study by the ESRI of the financial implications of a radiation event in Western Europe. There have been no studies of the environmental benefits to Ireland arising from the construction of HPC. The RPII study of the radiological impact of the UK’s new nuclear build programme largely agreed with the British study, in that there would be no radiological impact on Ireland from routine operations and from most accident scenarios. However, the RPII identified an extremely unlikely (1 in 33 million per year) severe accident scenario where some precautions would be advisable if it occurred at Wylfa, north Wales (which is much closer to Ireland than HPC during weather “which maximised the impacts in Ireland (such weather conditions were found to occur less than 1% of the time for the 21 years studied)”. They reported that the resultant higher radiation “doses would not cause observable health effects” and that “the appropriate protective action would be to advise people to stay indoors as much as possible during the 24 to 48 hours when the plume was passing directly over Ireland. Staying indoors for this period could lead to significant reductions of up to 80% in the radiation dose”. “In none of the accident scenarios studied, including the most severe one, was evacuation from the east coast of Ireland found to be an appropriate action to take”. Although a severe nuclear accident in Britain would have no observable health impacts in Ireland and evacuation would not be required, “food controls or agricultural protective measures would generally be required in Ireland to reduce exposure of the population so as to mitigate potential long-term health effects”. “If appropriate protective actions were not taken in the year after the postulated accident for the most severe accidental release/’worst case’ weather combination, the predicted radiation doses from ingestion of contaminated foods would be unacceptably high and could be expected to lead to an approximately 2% increase in the risk of developing a cancer in the decades following such an accident”. “However the timely introduction of appropriate agricultural management actions and food controls, as envisaged in the National Emergency Plan for Nuclear Accidents, would substantially reduce most of this radiation dose and be very effective in controlling radioactivity levels in foods for sale, radiation doses to people, and hence health impacts”. In essence, the RPII study looked at worst-case accident scenarios from the nearest nuclear plant to Ireland (Wylfa) during worst-case weather conditions and at the most sensitive time of year, assuming no precautionary measures were taken (people stayed outdoors continuously and contamination was not diluted by rain or washing). Even with these assumptions, they found there would be no need for any protective measures to be taken, except in the worst case scenario when staying indoors for 24 to 48 hours would be advised. In no case was the taking of Iodine tablets or other products required. However the timely introduction of appropriate agricultural management actions and food controls would substantially reduce most of this radiation dose and be very effective in controlling radioactivity levels in foods for sale, radiation doses to people, and hence health impact. The ESRI report focuses on the potential economic costs that would be associated with a nuclear accident in Western Europe, close to Ireland. It estimates the costs and losses directly attributable to an accident, as well as any losses associated with reputational damage that might arise if Ireland was widely perceived to be within the geographical zone affected by an accident, e.g. in export markets. The estimated costs are based on the releases occurring at the time of year that would cause the greatest economic impact. The report notes that “the risk of a nuclear accident is very small, and particularly so with respect to other energy sources”, and “one purpose of this study is to provide an indicative value of the cost it would impose on Ireland’s economy and society”. Other quotes from the report include: “In the case of a nuclear accident it is the perception of risk rather than actual risk that matters in the case of reputational losses”. “The two study dates selected for the scenarios in this report are possibly the time of the year when a nuclear accident would cause the greatest impact”. “In each of the four scenarios considered it is assumed that there are no direct health impacts on the human population within Ireland, which is consistent with the accident scenarios studied in RPII”. The “conservative, lower bound” estimate of costs associated with the 4 accident scenarios considered ranged from €4 billion to €161 billion. While the ESRI estimates of costs for potential large releases of radioactivity from HPC are considerable, it is not clear that these costs are relevant to the current consultation, which is concerned with the environmental impacts of such releases. The RPII have estimated these environmental impacts along with their likelihood and have found that in the unlikely event of a serious accident at Hinkley Point when the weather was unusually unfavourable, there would be no measurable health impacts in Ireland from any resultant radiation. The timely introduction of appropriate agricultural management actions and food controls, as envisaged in the National Emergency Plan for Nuclear Accidents, would substantially reduce most of the radiation dose from ingestion of contaminated food produce. This risk would need to be balanced against the environmental impact of not constructing HPC. There would an additional emission of 700 million tons of carbon dioxide if HPC’s electricity were to be replaced by Gas – with certain environmental impact – and that has to be balanced against the impact of a very unlikely accident at HPC. While emotions can sometimes run high on both sides of this argument, the positions that have the best chance of being considered are probably those that are based on the actual environmental impacts of HPC on Ireland. At this juncture, there does not appear to be a strong case for stopping HPC on the grounds of environmental impact on Ireland. Identify your comments on the significant effects on the Irish environment resulting from Hinkley Point C Nuclear Power Plant. The consultation is likely to ignore all other comments, especially as an Environmental Impact Assessment has already been conducted to Britain’s satisfaction, planning consent has already been granted for the project, and it is already under construction. clearly identify any material in the submission that is considered to contain confidential or personal information. Responses to this consultation are subject to the Freedom of Information Act 2014 and Data Protection legislation. The deadline for the receipt of written submissions or observations is by close of business on Tuesday 17 April 2018. More complete information is available on the Irish Department of Housing’s website. …that for certain activities, in particular nuclear energy-related activities, while the chance of a major accident, accident beyond design-base or disaster occurring is very low, the likelihood of a significant adverse transboundary impact of such accident can be very high. Therefore, the Committee believes that on the basis of the principle of prevention, when considering the affected Parties for the purpose of notification, the Party of origin, should be exceptionally prospective and inclusive, in order to ensure that all Parties potentially affected by an accident, however uncertain, are notified. The Radiological Protection Institute of Ireland (RPII) was requested by the Minister for the Environment, Community and Local Government to undertake an assessment of the potential radiological impacts on Ireland from this New Build Programme. This report presents the findings of the potential impacts on Ireland of both the anticipated routine radioactive discharges and of a range of postulated nuclear accident scenarios. Given the prevailing wind direction in Ireland, radioactive contamination in the air, either from routine operation of the proposed nuclear power plants or accidental releases, will most often be transported away from Ireland. The routine operation of the proposed nuclear power plants will have no measurable radiological impact on Ireland or the Irish marine environment. The severe accident scenarios assessed ranged in their estimated frequency of occurrence from 1 in 50,000 to 1 in 33 million per year. The assessment used a weather pattern that maximised the transfer of radioactivity to Ireland. For the severe accident scenarios assessed, food controls or agricultural protective measures would generally be required in Ireland to reduce exposure of the population so as to mitigate potential long-term health effects. In the accident scenario with an estimated 1 in 33 million chance of occurring, short-term measures such as staying indoors would also be advised as a precautionary measure. In general, the accidents with higher potential impact on Ireland are the ones least likely to occur. Regardless of the radiological impact, any accident at the proposed nuclear power plants leading to an increase of radioactivity levels in Ireland would have a socioeconomic impact on Ireland. A major accidental release of radioactivity to the Irish Sea would not require any food controls or protective actions in Ireland. There is a continuing need for the maintenance of emergency plans in Ireland to deal with the consequences of a nuclear accident abroad. In none of the accident scenarios studied, including the most severe one, was evacuation from the east coast of Ireland found to be an appropriate action to take. This release time coincided with easterly winds and rain over the east coast of Ireland during the passage of the plume and resulted in a level of deposition at the upper end of the highest band of deposition values. The most severe accident scenario considered, a Loss Of Coolant Accident (LOCA) combined with bypass of the reactor containment leading to significant releases of radioactivity to the air, had an estimated 1 in 33 million chance of happening in any given year. Combining this release scenario (or source term) for an accident at the proposed nuclear power plant location with the largest potential impact on Ireland (Wylfa, north Wales) and with a weather pattern which would maximise the impacts in Ireland (such weather conditions were found to occur less than 1% of the time for the 21 years studied) led to predicted radiation doses of approximately 18,000 µSv to someone remaining outdoors throughout the period when the radioactive plume passed over the east coast of Ireland. While such a radiation dose is considerably higher than that incurred from the routine discharges to the environment, it would not cause observable health effects. It is high enough however that the appropriate protective action would be to advise people to stay indoors as much h as possible during the 24 to 48 hours when the plume was passing directly over Ireland. Staying indoors for this period could lead to significant reductions of up to 80% in the radiation dose. Cumulative radiation doses to people in Ireland one week and one year after the postulated accident were also calculated; the cumulative radiation doses after one year were seen to be dominated by ingestion of contaminated food. The predicted radiation doses from ingestion of contaminated foods were calculated to be 381,000 µSv in the year after the postulated accident for the most severe accidental release/’worst case’ weather combination. This level of radiation dose would be unacceptably high and could be expected to lead to an observable increase in cancers (an approximately 2% increase in the risk of developing a cancer) in the decades following such an accident if appropriate protective actions were not taken. However the timely introduction of appropriate agricultural management actions and food controls, as envisaged in the National Emergency Plan for Nuclear Accidents, would substantially reduce most of this radiation dose. While these controls have been shown to be very effective in controlling radioactivity levels in foods for sale, radiation doses to people, and hence health impacts, they do have significant socio-economic implications and costs, possibly lasting for months or years following such an accident. Depending on the time of year, the foodstuffs most quickly affected would be leafy vegetables grown in the open and milk, with meat potentially being affected after a number of weeks or months. The findings from this assessment will be used both for RPII’s role to assess the radiation doses received by the Irish population and also to inform the RPII’s, and Ireland’s, emergency planning arrangements for nuclear accidents. Due to Ireland’s distance from overseas nuclear facilities, ingestion of food containing elevated levels of radionuclides has long been considered by the RPII to be the most significant potential exposure pathway to the population in the event of a large scale nuclear incident with the potential to contaminate a wide area of the country. This has been confirmed by the results of this assessment. It is clear that the most appropriate protective actions for Ireland in the event of a nuclear accident in the UK are food controls and agricultural measures, with the additional advisory of staying indoors for up to two days being appropriate in the case of more severe nuclear accidents. In none of the accident scenarios studied, even the most severe one, was evacuation from the east coast of Ireland found to an appropriate action to take. Both direct costs and losses arise as a result of a nuclear accident. Ultimately these costs and losses arise because perceived or actual threats to human health result in changed demand for Irish products. This includes any restrictions in EU or global markets of imports from Ireland. Losses will also arise because of perceived threats to human health even if products are officially certified as fit for consumption. This type of loss might arise because of a loss in trust in Irish produce and is termed a reputational loss. It is noteworthy that the largest category of losses in the study of the costs of a French nuclear accident (Pascucci-Cahen and Patrick, 2012) was reputational loss, accounting for approximately 40% of total losses. Reputational losses include the value of uncontaminated and perfectly safe produce which is not consumed; lost tourism revenue because tourists choose to travel to alternative destinations which 10 are perceived to be safer; and more generally a loss in exports. In the aftermath of a nuclear accident it is reasonable to expect that consumers will consider Irish produce to be contaminated, regardless of whether it is certified as safe to consume. The conservative, lower bound estimate of costs associated with the 4 accident scenarios considered ranged from €4 billion to €161 billion. One of the unjustified criticisms of nuclear energy for Ireland is that we couldn’t afford the large cost involved. While it is hard to defend the enormous capital cost of the very large nuclear station being built at Hinkley Point in Britain, Ireland is unlikely to build such a station. Instead, we are likely to wait a year or two until smaller, cheaper and even safer plants become available and economically attractive to our relatively small island. 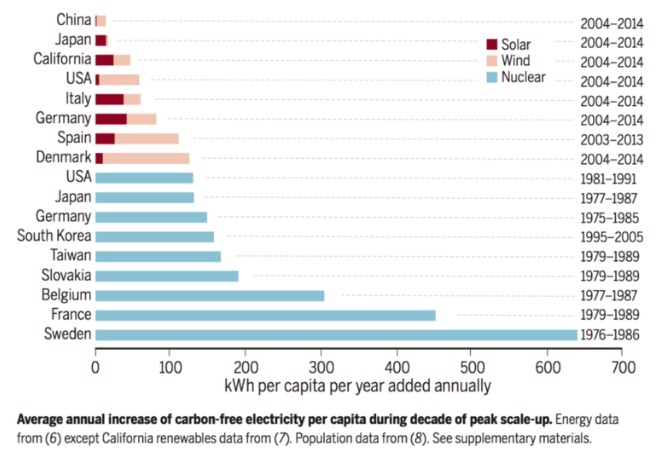 One way to assess whether nuclear is economically attractive to us is to understand the economics of other low-emission technologies, one of which is solar energy. The costs of Solar Photovoltaic (Solar PV) panels have fallen dramatically in recent years, so it is time to have a look at the figures as they might apply to Ireland in 2018. The 2017 Irish Solar Energy Association Annual Conference in November heard that there is €1 billion of investment in solar technology planned for Ireland. The suggestion was that rooftop solar panels in schools would enable communities to see tangible benefits and the resulting long-term energy savings should go directly to the schools. Enabling this would create 7,000 direct jobs, save the exchequer €210 million a year, and maintain Ireland’s attractiveness for foreign investment. A spokesperson said that, as a taxpayer, he was really concerned about the prospect of annual fines of up to €420 million facing Ireland. There are two different scenarios at play here – solar farms and rooftop solar. Most of the current planned investment is for large-scale solar farms that require dedicated land banks and export electricity export to the grid. These solar farms are subject to the EU Emissions Trading Scheme (ETS). However, rooftop solar has higher maintenance costs and normally supplies the building supporting the roof with only the excess electricity being exported to the grid. These are non-ETS solar schemes. Solar energy farms involve large arrays of solar panels over a number of acres of land, as in Figure 1 below. 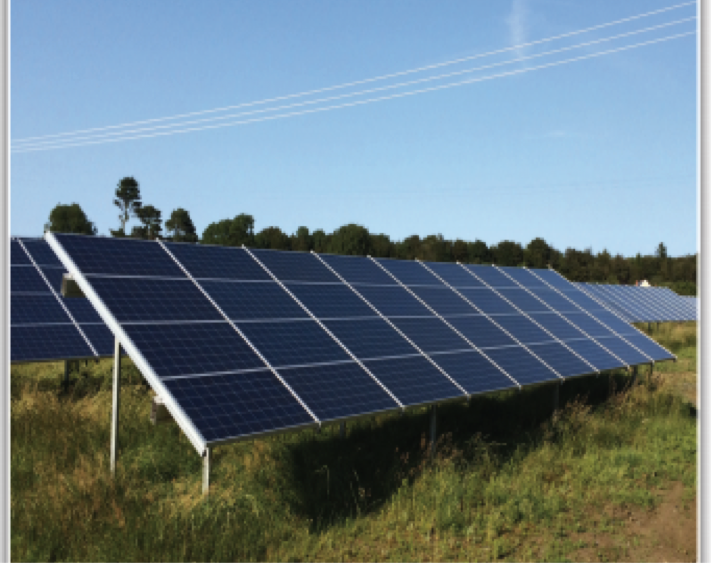 A recent project in Northern Ireland, for example, concerns a 5 MW solar farm being installed on 33 acres for a reported £7 million. The owner, a large user of electricity, says that the electricity produced will be worth over £500k per year. This confirms that it will operate at around 10% capacity factor. [5MW capacity, 10% capacity factor, £118 per MWh, 8760 hours per year yields £517k per year]. Excluding maintenance costs of at least £70k per year and interest, legal, insurance and other overheads, the project appears to return £517k on a capital investment of £7 million. This would be an unacceptably low return on investment of 7.4% from which to fund the above costs and repay the capital. Would placing solar panels on the rooftops of schools – who pay more for their electricity – make more economic sense? The downside here is that schools are only open for 183 days per year at primary level and 167 days per year at post-primary level and are normally closed during most of the summer season when solar panels are producing most of their energy. If schools were to use 20% of the annual solar energy, avoiding the need to pay 20 cent per unit for electricity, and export the remainder at €80 per MWh, that electricity would be worth €456k annually. This is an even less attractive proposition than the solar farm in the previous example, and is not economically viable. Using the examples above, €1 billion would buy 632 MW worth of solar farms and produce 550,000 MWh of electricity per year. If this was valued similarly to onshore wind which receives a guaranteed price of €80 per MWh, that electricity would be valued at €44.3 million per year. This is well short of the €50 million annual interest charge on the capital (at 5% per annum), the estimated €10 million annual maintenance charge and legal and other overheads. To return reasonable breakeven operating costs of €66 million annually, the solar electricity would need to be priced at €120 per MWh, which is 50% higher than the guaranteed price for electricity from onshore wind. This does not make economic sense. On average throughout the year in Ireland, electricity emits 468 grams of carbon dioxide per unit. This can be expressed as 0.468 tons of CO2 per MWh. Although emissions are often lower in summer – when solar energy is at its peak – and solar energy is more likely to displace flexible and cleaner gas rather than dirtier and less flexible coal and peat, using the average figure indicates that 632 MW of solar farms could avoid 260,000 tons of CO2 annually. This has a value to electricity producers who are subject to the Electricity Trading Scheme (ETS). 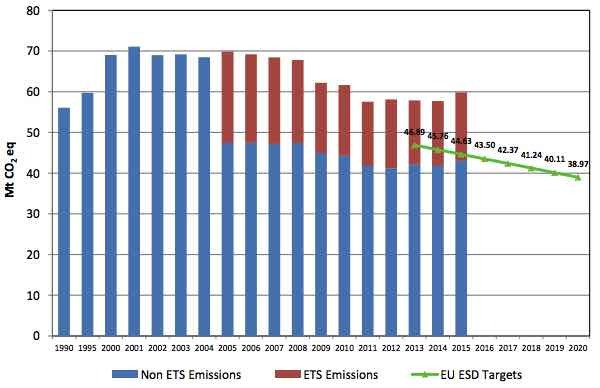 The current market price for CO2 in the ETS has been consistently below €10 per ton since 2011 (see Figure 2 below), so the avoided CO2 would be worth less than €2.6 million. This does not significantly alter the lack of an economic case for solar farms. Figure 2. 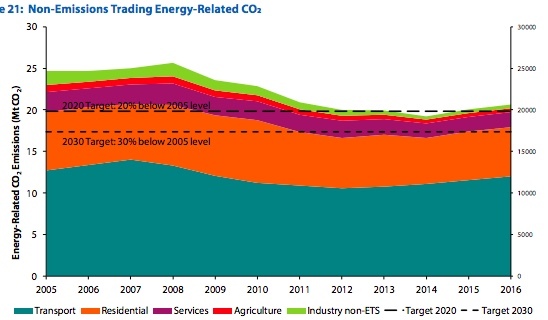 EU ETS prices since 2008. Price has been less than €10/ton since 2011. For rooftop schemes that fall in the non-ETS sector, there is a value attributed to their use in increasing the amount of renewable energy used in Ireland. 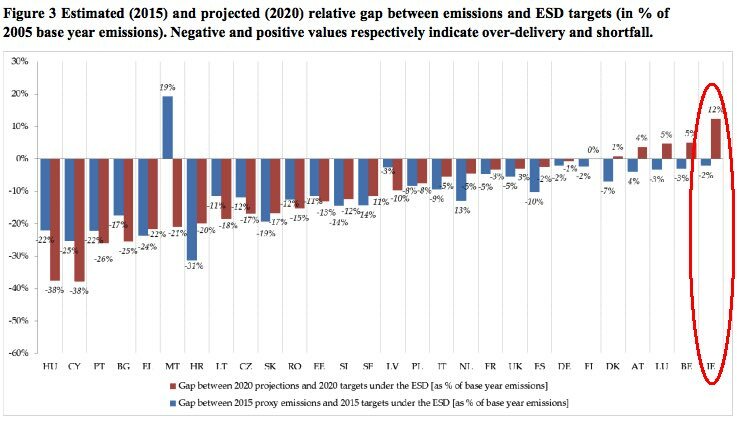 Aside: Although the climate is influenced by greenhouse gas emissions, Ireland’s emissions from electricity are within our allowed limits and lowering these emissions further is of little or no financial benefit to us, as explained above. Nonetheless, Ireland has committed to getting at least 16% of our energy from renewables by 2020 and will probably be fined at an estimated rate of approximately €120 million for every % underachieved. 632 MW of rooftop Solar PV could produce 550,000 MWh of electricity per year, supplying around 2% of Ireland’s electricity. As electricity represents around 20% of the energy used in Ireland, this solar energy could contribute about 0.4% of renewable energy to Ireland’s total at a potential value of €50 million. If this penalty has a realistic chance of being avoided, then there may be economic merit in rooftop solar. This aspect could merit further study. 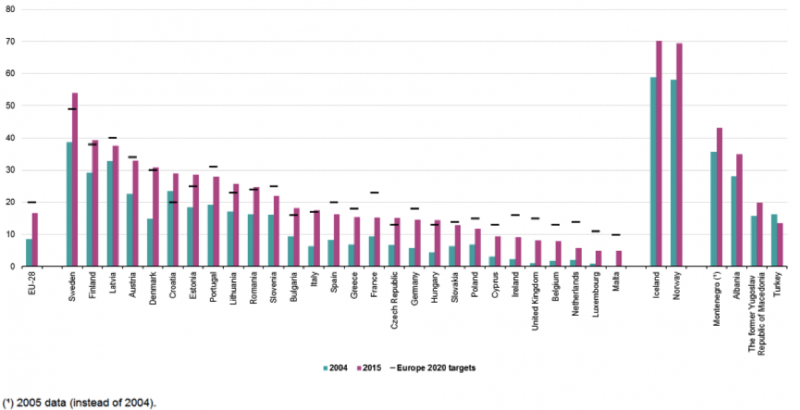 While rooftop solar is less effective and has higher annual costs than solar farms, there is a possibility that it may make more economic sense if it can be used to contribute to Ireland’s renewable energy targets under the EU Effort Sharing Directive. However, the above analysis may not completely capture all the nuances of how Renewables targets are calculated under this Directive, so any corrections in that regard would be very much appreciated. These calculations take no account of constraints or curtailments required to ensure electricity grid stability – some solar energy may not be usable due to an excess of Renewable electricity available at any time, or other generators may need to act ‘out of merit order’ in order to accommodate fluctuations in intermittent energy sources such as solar or wind. Such constraints costs exceeded €130 million in 2017, so even a 2% increase here would amount to €2.6 million. Also ignored is the need to repay the €1 billion capital cost. Repaying this cost over 20 years would require €50 million per annum. Finally, given that solar energy will be near zero at times of our highest demand for electricity – dark, mid-winter evenings – we must retain sufficient non-solar generators to supply our largest electricity needs. This means that solar energy is not technically required to satisfy electricity needs unlike non-solar generators, which are required. Further, as the non-solar generators will have lower load factors as they are displaced by solar energy, their loss of income will need to be made up in some way for them to remain in business. These extra costs are also ignored in the above analysis. There is quite an amount of detail behind this analysis of a complex topic, so I’m open to query on any or all of it. But, the conclusion for now is that solar PV farms do not appear to have an economic case for Ireland in 2018. Hurricane Ophelia and Storm Brian are stark reminders of the damage, death and destruction that weather-related events can bring. Whether such events are a direct result of Climate Change or not, we are also aware that such extreme weather events are becoming more common and more powerful. We also now better understand that air quality has a significant impact on our health, which is why we plan to dramatically reduce the number of diesel and petrol engines used in transport – the sale of such engines may be banned here from 2040. In Ireland in 2015, fossil fuel power stations released 11 million tons of greenhouse gases that contribute to climate change. They also released particulate matter (PM) and 9,500 tons of nitrogen oxides (NOx), both of which contribute to unhealthy air. These are matters of serious public concern. As we cannot realistically reduce our emissions significantly without the support of the public, Government asked our Citizens’ Assembly to consider how the State can make Ireland a leader in tackling climate change. Their conclusions will form the basis of reports and recommendations to be submitted to the Houses of the Oireachtas for further debate by our elected representatives. The Assembly members were to hear from a range of national and international academics, practitioners and experts on climate change and learn how nations are affected by it and respond to it. So far, so good! The members heard about excellent initiatives by individuals and groups who made changes at their local level, at work or in their communities. And there were calls for a tariff for excess solar energy fed back into the electricity grid. (Caution: this measure would require all customers to subsidise those wealthy enough to install solar panels). But they also heard that our energy policy will not meet our targets for 2020, 2030 and 2050 and that new policy initiatives are required. Yet precious few potential new initiatives got an airing over the 2 days of deliberations. 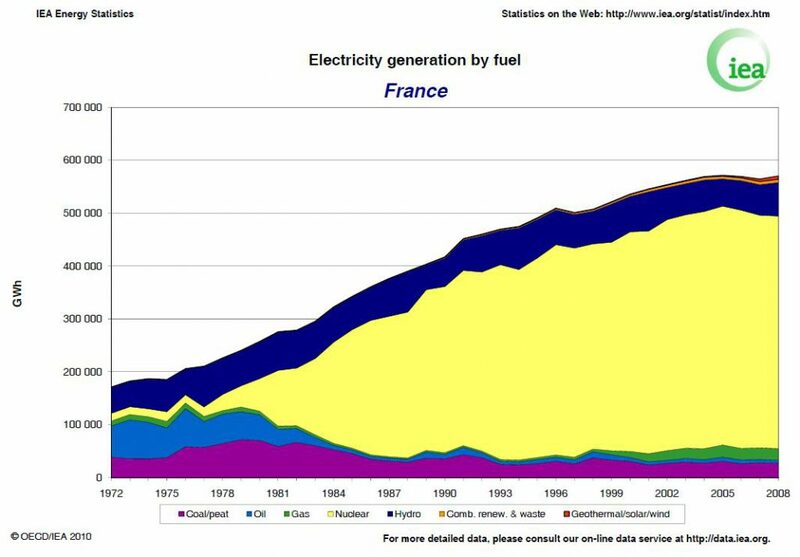 The members didn’t hear that Nuclear Energy is the single most effective technology ever used to rapidly decarbonise a nation’s energy – as achieved by France in the 1980’s (see the graph below). New nuclear plants are expected to be even safer and cheaper than existing plants and will be small enough for Ireland within a decade. Nuclear energy is not currently legal in Ireland. Nor were members told about Carbon Capture, a technology that most experts believe to be essential in keeping global warming below 2 degrees, the conservative target of the 2015 Paris climate agreement. Carbon Capture is also not currently legal in Ireland. They did not hear about South Korea’s Citizens Jury who have recently voted to recommence construction of two nuclear reactors in the south of the country. These two reactors will avoid the need to build gas-fired plants which would burn up to 10 million tons of gas, resulting in up to 30 million tons of emissions, each year. The members will probably not be aware that Singapore will stop adding cars to their roads from February 2018 while they intend investing €18 billion in public transport over the coming 5 years. These are all examples of initiatives that could help Ireland to at least meet its climate change commitments, even if we remain far from the goal of leadership in this regard. But, because there was no discussion of anything other than the renewables-only solutions that are already enshrined in our failing Energy Policy, it will be no surprise if no new policies will be proposed for consideration by the Oireachtas – and the whole process will have achieved little of any consequence. This is an important exercise in deliberative democracy, placing the citizen at the heart of important legal and policy issues facing Irish society today. With the benefit of expert, impartial and factual advice, the 100 citizen members could be capable of proposing considered recommendations on our energy future, as they did for the questions of the Eighth Amendment and our Ageing Population. But to attempt to consider how Ireland can lead in tackling climate change without considering the full picture is a fools errand. Surely, the Assembly members, and the people of Ireland, deserve better – particularly as the Government has already said “that Climate Change is one of the most important long-term challenges facing Ireland“. 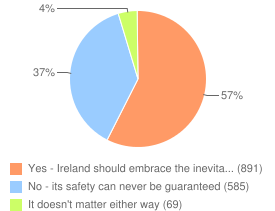 There may also be more support for allegedly unpopular proposals such as nuclear energy, as a number of small polls have found a majority of Irish people to be in favour of at least considering nuclear here. And the 800,000-strong ICTU also agree that nuclear should be part of the debate. Majority in favour of a Nuclear debate – even after Fukushima. If the Government is to meet its commitment to the transformation required to achieve a low carbon and climate resilient future, it will need to examine much more than the simple solutions currently being considered. 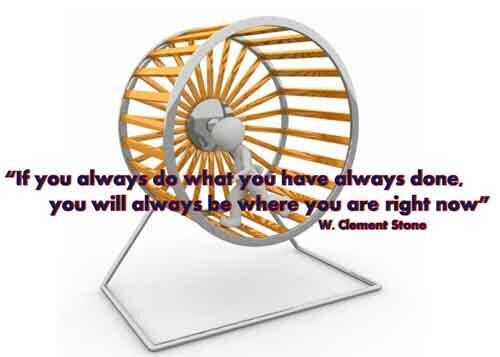 In other words: if we are to get different results, we really need to stop doing the same things! Author Denis DuffPosted on October 24, 2017 January 5, 2018 Categories UncategorizedLeave a comment on Same thing; different results?